We generally believe that trying to definitively identify the first of anything in the automotive world is at best a perilous endeavor, but for those keeping score, honors for the earliest American pillarless hardtop may go to Dodge. Back in 1916, Dodge Brothers body engineer George E. Goddard filed for a design patent on a two-door sedan body with no B-pillars, although we don’t know if any such cars were actually built. In configuration, however, they would have been at least as deserving of the term hardtop as any number of sixties and seventies cars. 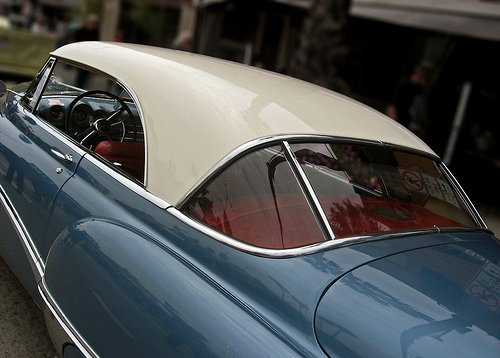 By “hardtop,” we mean a closed body (whether two-door, four-door, or wagon/estate) with a fixed roof and no B-pillars, often (though not necessarily) styled to look like a convertible with the top up. That sounds simple enough, but in practice, definitions can quickly become hazy. 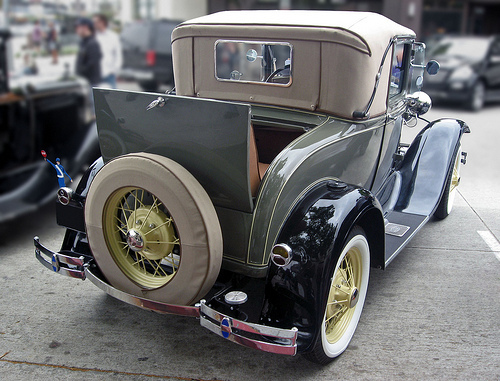 In the twenties, for example, bolt-on “California tops” became a popular aftermarket accessory for roadsters, the ancestors of the later detachable hardtop. Since the installation or removal of a California top was often cumbersome — a job for the dealer or at least a chauffeur — a fair number probably became more or less permanent features. From there, it was a short step to the factory-built fixed-head rumble seat coupe, usually sharing its proportions and much of its sheet metal with the equivalent roadster or cabriolet, but sporting a permanent metal roof. Some carried the convertible resemblance even further by adding decorative landau irons and cloth or leatherette roof coverings. Fabric roof, tiny backlight, landau irons, rumble seat — it must be a cabriolet, right? Wrong — this 1931 Ford Model A is a fixed-head Sport Coupe. We must admit it fooled us, since Ford also offered a very similar-looking Model A convertible sedan with fixed side window frames like those of this car. Technically, many such models would qualify as hardtops. Three-window fixed-head coupes didn’t really have B-pillars and in this era, the structural differences between a rumble seat coupe and a cabriolet were seldom vast. However, the cars weren’t really marketed that way. The sport coupe or rumble seat coupe was just one more body style in a list that might run to 15 or more, usually priced somewhere above the basic roadster (which generally lacked roll-up windows), but below a true convertible coupe. Three-window coupes of this kind usually sold in fairly modest numbers and for the most part were not particularly special. Most had disappeared by the outbreak of World War II, superseded by the club coupe or two-door sedan, which was less sporty, but didn’t consign rear passengers to a rumble seat in the rain. Excepting the occasional coachbuilt one-off, prewar five-window club coupes rarely qualified as hardtops. Not only did they have B-pillars, all the roof posts were typically quite stout, a symbol of the body engineer’s ascendancy over the stylist. There were a few exceptions — Triumph briefly offered a sleek pillarless “Flow-free” two-door sedan body for its Gloria Six in 1935 and the Lincoln Continental Coupe was little more than a convertible with a fixed steel roof, although it was not pillarless — but the ascension of the five-window, four- to six-passenger pillarless hardtop coupe would have to wait until after the war. 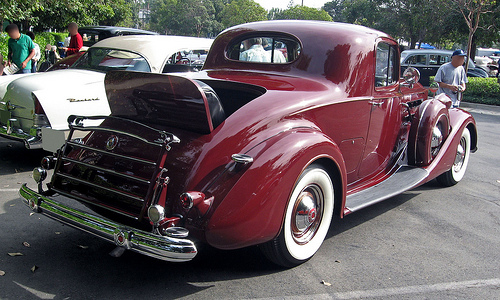 Rumble seat coupes were not limited to low-end makes. This is a Fifteenth Series Packard Twelve, originally priced at over $3,400 — enough to buy four 1937 Ford DeLuxe cabriolets. 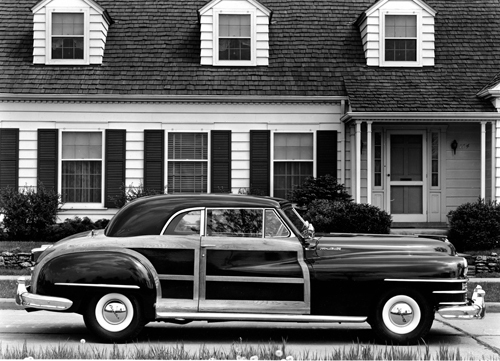 Starting in 1941, Chrysler offered a small number of attractive, wood-bodied Town & Country models, built (and originally suggested) by Pennsylvania’s Boyertown Bodyworks. The earliest Town & Countries were estates, akin to Packard’s postwar Station Sedan, riding either a Chrysler Royal or Windsor chassis. Around 2,000 were built before the end of civilian production in early 1942. Shortly after the war, Chrysler president David A. Wallace decided to expand the Town & Country line with a much broader range of body styles, presumably as traffic builders for dealers. The wood-bodied cars were pricey and maintenance-intensive, but in showroom condition, they were lovely conversation pieces. Chrysler’s Art & Colour Section, then headed by Henry King, quickly turned out renderings of five new Town & Country models: a four-door sedan, a two-door brougham, a roadster, a two-door convertible, and a neat pillarless hardtop coupe, all apparently chosen at the instigation of Chrysler’s sales organization. According to stylist Arnott (“Buzz”) Grisinger, who worked on the project, the designs were done in such haste that there were none of the usual scale models or clays. Except for the roadster, aborted early on, the new bodies went directly to the full-size prototype stage. Although Chrysler issued a sales brochure for the expanded Town & Country line in June 1946, the planned line extension was hastily scaled back. We assume high production costs had something to do with it, as did the recognition that the postwar sales boom was giving dealers all the traffic they could handle without a big investment in ‘halo’ cars. The Town & County sedan and convertible went into production, replacing the estate, but only a single brougham and seven hardtop prototypes were built. The brougham went nowhere and the hardtop would not go on sale until more than three years later. I’d say one of the biggest reasons for the disappearance of hardtops was the widespread application of automotive Air Conditioning. On of the main reasons for pillarless bodies was the fact that they opened up the whole car interior and improved ventilation, especially in the hot summers in most of the US. By the 70’s A/C was becoming commonplace, and the need for 2 or 4 open windows was going away as we all became comfy in our air-conditioned cocoons. Remember the Mercury Breezeway? today, almost every car is equipped with factory air, and there’s little need to open a window for fresh air; and the cabin air filter keeps the interior air fresh, and keeps dust and bugs out. While changing tastes are certainly a part of the demise of the hardtop, I propose it was the humble air conditioning compressor that killed them off. I think that was a factor, but I don’t think it was the primary reason, particularly for high-end cars like the Eldorado and Continental Marks, where the take-up rate for air was already quite high by the late sixties. Also, I don’t think the ability to roll down all the windows was nearly as important to the popularity of hardtops as style. Particularly on a lot of early-seventies hardtops, with their extreme tumblehome, opening the side windows even partly tended to create massive buffeting; it wasn’t that practical for ventilation unless you spent a lot of time under 35 mph. The biggest contributor to the demise of the hardtop was the strengthening of federal rollover crash standards for the 1974 model year. 1973 was the last year for hardtop coupes in the General Motors full size lines. Hardtop four-door sedans were gone by 1977. Air conditioning really didn’t have much to do with it. That is a popular explanation, although my research suggests that it’s only partly true. After originally posting this article, I looked up what the federal standards actually are. The standards to which people are generally referring when they talk about this are 49 CFR 571.216: Federal Motor Vehicle Safety Standard No. 216, Roof Crush Resistance. As actually enacted (an important point that I’ll get into in a moment), FMVSS 216 went into effect for passenger cars (i.e., vehicles with a GVWR of less than 6,000 lb/2,722 kg) on September 1, 1973, the beginning of the 1974 model year. Under the standard, the vehicle’s roof must not deform more than five inches (127 mm) when subjected to a vertical force equal to the lesser of 1.5 times its empty weight or 5,000 lb (22,240 N). Convertibles are exempt. The effective date of that standard means that a fair number of hardtop coupes did indeed meet that requirement. (There were no phase-in provisions, and no exemptions other than convertibles and vehicles over the GVWR limit.) Until very recently, that was also as stringent as it actually got; new rules have been enacted, but the phase-in process doesn’t begin until MY2013. However, from what I’ve been able to gather, the version of this standard that was originally mooted was a good deal more stringent than what was actually enacted. (The AMC Pacer, for instance, was designed with provisions for an integral roll bar through its B-pillars, in anticipation of those rules.) All of the FMVSS were the focus of intensive lobbying and occasional threatened or actual legal action by automakers, and there was considerable political pressure on both sides. Sorting out the details of what was originally proposed and how it evolved is complicated at this remove, and would probably involved some hard time in front of a microfilm reader, but it’s likely that the existing regulation was a compromise. In any case, I think it’s probably reasonable to say that the decision to phase out hardtops (and convertibles; I gather that the exemption in that case was a late change) was strongly influenced by the [i]proposed[/i] regulations, and by the time the somewhat less stringent actual regulations were decided, styling decisions had been made and tooling had been bought. The Pacer again is probably a revealing example — the B-pillar design didn’t change, even though the production cars didn’t actually have the roll bar. And after that, designers and product planners not in the habit of leafing through federal regulations over breakfast may have just assumed that the game had moved on, and pursued other themes. Amen, Admin on 70’s frameless glass and buffeting. GM “Collanade” intermediates being a notable offender. Practically, the mechanisms for holding the glass in place became less robust on most makes, hitting a nadir on GM mid- 80’s G bodies and 95 through 99 Neons. Flap city. Long after they were gone from these shores, the Germans, in the form of the lovely W124 chassis CE coupes, kept the pilarless hardtop alive. The BMW E31 8-Series was also a pillarless hardtop (as were the earlier E9 coupes), but BMW hasn’t been as consistent with pillarless models; the E63 6-Series is not, nor, I believe, is the new F13. An enjoyable entry as always – but it seems to me that the decline of “the hardtop aesthetic” deserves further analysis. It may be true that “many American preoccupations of the time [the 1970s] demanded a certain privacy” (if people wanted privacy why didn’t they go indoors? ), or that something about the political nature of the 1970s was involved as you suggest. But there are much earlier instances of more “intimate” greenhouses – for instance, the two- and four-door 1962 GM full-size hardtops and sedans (versus the very similar but larger-windowed 1961s) – as well as much later examples, such as the K-car-derived New Yorker and Imperial sedans of the early 1990s still sporting opera windows (built into the rear doors) and wrap-over rear roof treatments. Like hardtops, blind quarter panels and formal roofs were not at all new — they were common on limousines, of course, and were prominently featured on a lot of the Derham customs and semi-customs of the forties and fifties. They popped up here and there on mainstream cars — the GM cars you mention, the early-sixties Imperial LeBaron, and so on — but it wasn’t until the seventies that they really became ubiquitous. Likewise, the idiom held on into the eighties and early nineties, with a whole range of Chrysler products that all looked vaguely like miniature Mark Vs, but by then, they were really rather anachronistic. You still occasionally see cars with aftermarket coach tops that blank off half the quarterlights and a third of the rear window, but they’re the anomaly, rather than the norm. One could always say that the transition to the seventies pseudo-landau/brougham look was a shift from cars that looked sort of like sporty convertibles to cars that looked sort of like limousines. Certainly, the desire to look affluent is a major driving factor in a lot of automotive trends. On the other hand, the eighties were nothing if not wealth obsessed, but I think most affluent Boomers tended to turn up their nose at seventies-style symbols of luxury, so it wasn’t JUST that. The hardtop Hillmans were the Californians (and Sunbeam Rapiers), not the 4-door sedan Minxes. The roofs on the Californians at least were effectively welded-on hardtops on a convertible body shell in those years. Another interesting curiosity was later versions the 1948-54 Sunbeam Talbot 90 sedan (eg Mk3) which had a suicide rear door without a C pillar, just overlapping glass. I live in Brazil, where only two hardtop coupes have been made: the Dodge Dart/Charger (built 1969-81), based on the 1967-69 A-Body Dart, and the Chevrolet Opala (built 1971-89), based on the German 1967-71 Opel Rekord body, but powered by inline 4- or 6-cylinder Chevrolet engines (153/151 CID or 235/250 CID). From 1980 to 1982, my parents had a 1978 6-cylinder, dark blue Opala hardtop coupe. I absolutely loved it. When they decided to sell it, I made a drawing of it as a souvenir and, unaware of anything (I was 15 at the time), wrote its VIN at the back of the paper sheet. Thanks to this – and Google -, I was able to find the car in March 2009; it had been impounded about two years before, and was going to be auctioned and scrapped. I bought it back and restored it from the ground up. Today, I’m glad and proud to say it’s turning heads at the streets again, just as it did 30 years ago! Actually, I think everyone commenting missed the biggest factor in hardtops going away. Retractable three point seat belts. Starting in 1968 all cars had to have three point belts. In the early years they gave people separate belts, so you had 2 belts per seat and one for the center. So this would leave you with about 10 belt ends to sort through when trying to buckle up. My 71 Riviera has this problem, partially solved by having two different sized receptacles. I recently drove a 73 Lincoln Mark IV and it had a retractable bottom belt and a hole in the male end to snap the top piece into. Well, this required a lot of dexterity to pull it out, hold it, snap the top belt in and then put them together into the female end. Retractable three point seat-belts came out in the mid 70s and had one retractor on the bottom and a bolt in the B-pillar to hold the top. This was much easier to use. Not as many people wore seatbelts in those days, but even if only 20% of the people did, you could increase sales to those people with this system. But the system cannot work with a hardtop. It would leave an ugly belt going from roof to floor that would flap in the wind and impede rear seat access. Mercedes mounts the top belt to the bottom of the rear window frame. Because the doors need to be longer to allow rear seat access the driver would have to reach way behind them to grab the belt. Mercedes has an electric motor push the belt forward to the driver when the door closes. So this adds complication and expense. Well, the problem with this theory is that it would mean that three-point belts would also preclude convertibles, which was not the case. (Convertibles became rarer in the same period hardtops generally disappeared, but it wasn’t specifically because of seatbelts.) It’s true that some high-end convertibles do have complex and expensive “seatbelt handing” devices, but not all ragtops do: the MX-5/Miata being a prime example. While I agree its not the only reason I think it is one that was not addressed. I’m thinking about 80s cars like the Fox body Mustang where ragtop versions had seatbelts that were in the way of rear seat entry. That, on top of window sealing issues and not looking better, not being as stiff and being heavier all contributed to them never building a fox body Mustang with a hardtop even though they had a convertible. I think people would put up with the drawbacks for a convertible, but not a hardtop. I agree that I also cannot think of a car from the hardtop era that would look better with a pillar. But with modern window construction they have been able to make new windows more flush with the body. Then they paint the pillars black and it looks almost as good with none of the drawbacks. I’m curious if during the 60’s people actually rolled all the windows down. It seems to be quite a chore if you don’t have power windows and they were uncommon before the 80s. The sense of privacy issue you brought up seems to make sense. If I park in front of a restaurant I close all the windows and lock the car even if I can see the car from my seat. I think people were more apt to leave their car open in the 50’s and 60’s. Changing attitudes are probably the number one reason. My father built two 53 Studebakers. One in the 60’s, a hardtop. One in the 2000’s, a post coupe. He wanted the post so he could mount three point shoulder belts and he also wanted the additional structural rigidity since the car is built to handle too. He used frame strengthening parts from a hardtop frame to make the frame more stiff. When he was all finished he painted it dark red, but like modern cars he painted the door frames and pillars black. At a glance you hardly notice the post. In regards to rolling down the windows, I imagine it depended on the weather and the car. One thing about which we’ve gotten spoiled by modern cars is flow-through ventilation, which in mild weather can provide pretty good airflow in a lot of cars, even with the windows up. That wasn’t a strong point of most 50s and 60s cars, even ones that did have flow-through systems.